We’ve decided not to do a large Mobile Health conference in 2013. Instead, we’ll be hosting several smaller events that focus on behavior design and health. We hope to see you at one of this year’s events. To get the latest on dates, topics, and details for 2013 events, email us at info@mobilehealth.org. Below is information from 2012. 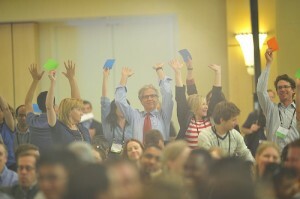 It’s true: People raved about our previous Mobile Health events at Stanford. Of course, as organizers, we were thrilled with the response. But this year we are going to break the mold. Problem #1 Big leaps in behavior change often leads to failure. Problem #2 Big jumps into collaborations often cause bad relationships. Problem #3 Big cycles in product development lead to slow innovation. As we see it, the “big” approach wastes time, money, and opportunity. At Mobile Health we will highlight a better solution . . . Seriously — an entire event about baby steps. We believe that rapid baby steps is the only (yes, the only) reliable way to create winning solutions in mobile health. We believe this so strongly, that our event will be all about baby steps, showing how the power of this approach can revolutionize innovation in Mobile Health. Like our previous events, things will move quickly. You’ll hear from many speakers. We’ll stick strictly to our schedule. No one will ramble on and on. By design, we’ll give you long breaks so you can meet the speakers and network with others. The good news is that baby steps lead to enduring behavior change. At Stanford Mobile Health, you’ll learn why baby steps work, how to sequence baby steps to a larger goal, and who has used baby steps to create interventions that succeed. The behavior change track at Mobile Health will allow you to bring this winning approach — baby steps — to your work back home. Collaborations are essential for big wins in Mobile Health. Why? Because almost no one has all the right tools from psychology, design, distribution, evaluation. You must partner with others to bring all these pieces together. But collaborations can be hard. And many partnerships fail, while others linger but never really achieve potential. At Mobile Health you will experience how to take baby steps to create partnerships that work. We will highlight ways to collaborate easily with others, without making commitments you’ll regret later. The analogy is pretty obvious: It’s helpful to date someone before you get married. You’ll learn new ways to have simple and short-term experiences together, with the option to grow the collaboration. In fact, you’ll experience some of these methods for yourself at Stanford. The traditional way to create health interventions is messed up. It takes too long to plan, create, distribute, and measure — and then do it all over again. This slow cycle may be ideal for winning grants (and getting them renewed), but it’s a bad approach for creating products that will have impact in the real world any time soon. Today, the need for better health is so critical that we urge people to abandon the slow, traditional processes of yesteryear. We believe innovators in Mobile Health need a faster process for developing and testing solutions. This is the only approach that wins today in the world of consumer Internet. And we wager it’s the only way innovators will win big in mobile health. 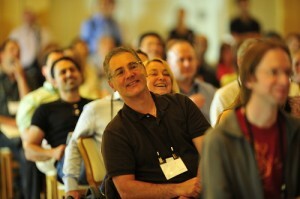 At our Stanford event, you will see how to quickly create solutions and test them. You’ll see methods of rapid iteration. And you will learn form people who have used this approach to change the lives of millions. We realize that “baby steps” is an odd focus for an entire event. But we think it’s the absolutely the right focus for 2012. The chronic problems in behavior change, collaborations, and product development have a common solution for innovators in Mobile health — and that solution is baby steps. We invite you to join us at Stanford for Mobile Health 2012 to learn how the power of baby steps makes it easier and faster for you to achieve big goals. One more note: Our events always sell out. So if you’re interested, please register now. Once space is gone, we can’t magically create room for you. So please . . . act soon.